"ARES is composed of licensed radio amateurs who have voluntarily registered their qualifications and equipment for communications duty in the public service, when disaster strikes. Every licensed radio amateur, whether or not a member of RAC or any other local or regional organization, is eligible for membership in the Amateur Radio Emergency Service. The only qualification is a sincere desire to serve. The possession of emergency-powered equipment is desirable, but not a requirement. Emergency service activities in each RAC Section are under the direction of the Section Emergency Coordinator (SEC), who is appointed by the Section Manager (SM). The radio amateurs in each community within the Section register their facilities with the local Emergency Coordinator (EC), who is also appointed by the SM or SEC. In order to provide better support, in areas where there are a large number of EC appointments, the position of District Emergency Coordinator (DEC) is appointed by the SM. Being RAC officers, these appointments must be RAC members. However , as noted above, other members of a local ARES organization need not be RAC members." EMRG is also known as Ottawa ARES, two names, one group, one purpose. ARES (Amateur Radio Emergency Service) provides a common look and feel for volunteer Amateur radio emergency communications groups across the country. In Canada, ARES is administered by Radio Amateurs of Canada (RAC). RAC does not assign ARES groups, rather an EC (Emergency Coordinator) is appointed for an area. The EC is responsible for establishing and maintaining clients, partnerships, and a group of amateurs that will support him/her in providing communications for those clients. ARES groups exist at a local level, to support local needs. The responsibility and authority in ARES is at the local EC level. The other levels in ARES above the EC are there to provide administrative and organizational support. Through Mutual Aid, ARES groups work together to link wider areas, and to provide additional resources to each other. Eastern Ontario has an excellent Mutual Aid program, with yearly meetings that keep improving on the relationships and plans. It is recognized that no ARES group can sustain a deployment for very long, using only it's own members, so Mutual Aid is a requirement, not an option. In Ottawa, EMRG has existed in different forms, over many years. In 1999 RAC requested that the EMRG Team Leader accept the ARES EC appointment for Ottawa, which would make EMRG an ARES group. 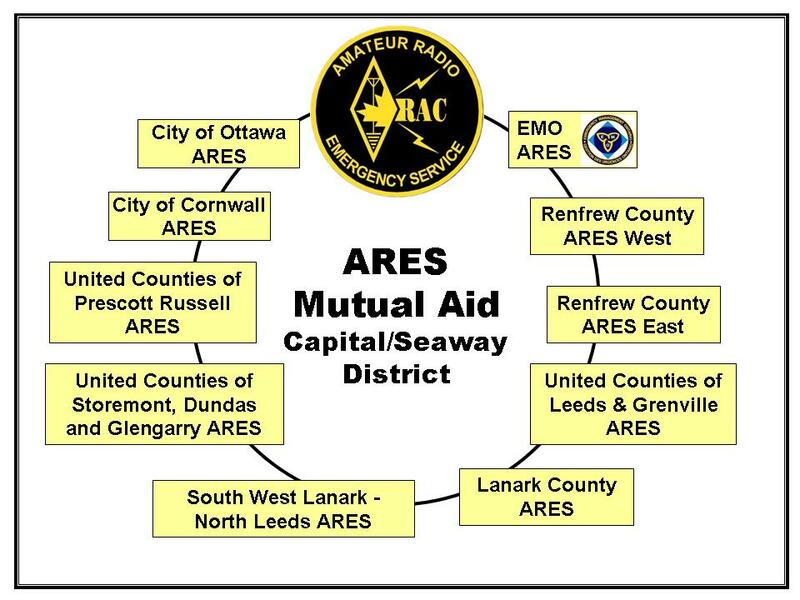 There was a move to expand the ARES name in Ontario at the time and RAC HQ had now moved to Ottawa, so it would look better if the local volunteer group was an ARES group. The idea was investigated and the EMRG management team accepted the idea, so EMRG then had two names, EMRG and Ottawa ARES. The original EMRG name was kept since all our agreements use the EMRG name and our group was known as EMRG for a long time. While most ARES groups support a local Municipality, the ARES group at Emergency Management Ontario (EMO) headquarters in Toronto supports a Provincial organization rather than a geographical area. The relationship between Ottawa ARES and EMO ARES is the same as with other ARES groups. Through Mutual Aid, the two groups would work to support the end goal, which would be communications between the City of Ottawa and the Provincial Emergency Operations Centre in Toronto. Communications with EMO is no more important than communications within the City of Ottawa, or with neighbouring ARES groups. Local information must be collected and reviewed in order to understand the local situation, so there will be information to exchange with EMO. EMO ARES will request Situation Reports (SitReps) directly from local Amateurs during an emergency. This is a practice that EMRG and the City of Ottawa do not support, so EMRG members are asked not to provide these reports. Only the City of Ottawa can speak for conditions in the City. Based on the low probability of losing long distance communications, the alternate local phone service arrangements implemented by the City, plus the option to use satellite phones, it is unlikely that the City of Ottawa would ever require EMRG to provide communications to EMO in Toronto. If EMRG was requested to provide communications, it would use the shortest radio path possible, meaning that VHF radio would be used to reach a station that has working phone service, either within the City, or in a neighbouring Municipality. If there is no VHF radio option, then HF would be used, through a home HF Relay station. While ARES client agreements are created at a local level, RAC has a signed MOU with the National Red Cross. This is a symbolic agreement, since the actual interaction and support between ARES and Red Cross is at the local level. Local ARES groups like EMRG are responsible to build a relationship with their local Red Cross. Without the local relationship, the National MOU is just a piece of paper. In an emergency, neighbouring ARES groups would be called on to provide assistance. This could be Ottawa ARES asking for help, or one of our neighbouring ARES groups asking us for help. The ARES Groups that are part of our Mutual Aid Plan are shown here. ARES Web sites are shown below.